Every March, the Rensselaer Educational Center Criminal Justice classroom becomes a courtroom for a day. After months of preparation, the junior class presents a mock trial, serving as the program’s major project. Each CTE program requires students to complete a major project that combines elements of what they’ve learned and present that learning to an authentic audience. The class selects a real trial and develops their case from start to finish. Half the class serves as prosecution team and the other serves as the defense. Students carry out all the pieces of a trial – opening and closing statements, questioning witnesses, evidence discovery, jury deliberation and verdict presentation. To make the project as authentic as possible, the prosecution and defense teams build their case separately allowing for surprises in court, just like their real-life counterparts. Criminal Justice Teacher Amy Gillett took a seat on the bench to preside over the court and once the trial was over, praised her students for their hard work and thanked all the staff who make this annual event possible. Students dress for their roles and take their presentations seriously. 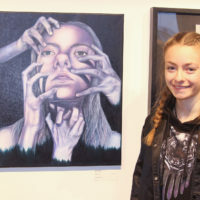 For many students, it is the first time they speak publicly in front of a large audience. The time and effort was evident through the attention to detail demonstrated while presenting and defending their case. East Greenbush student and Criminal Justice junior Morgan Hahn takes the stand in her defense at the 2019 Mock Trial. This year’s case was the State of New York versus Morgan Hahn. 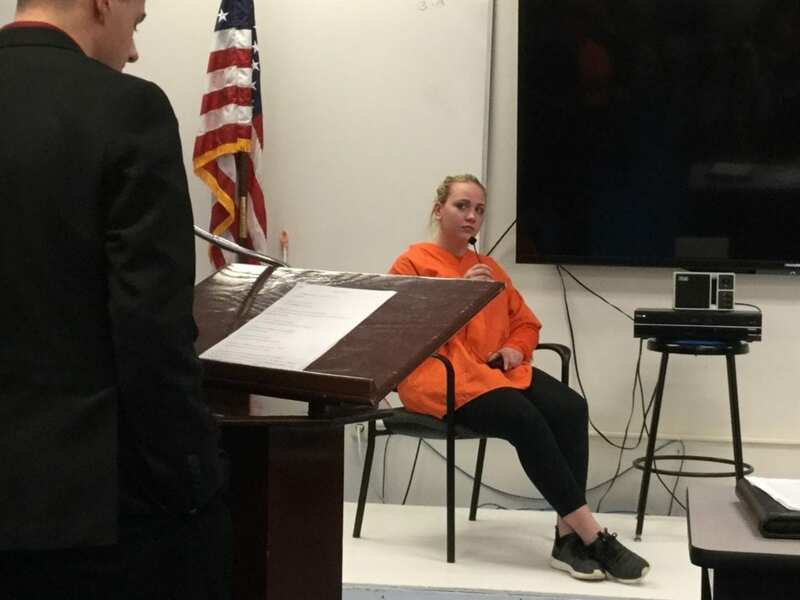 Hahn, a junior from East Greenbush CSD, played the role of a Troy Police Officer accused of murder for killing who she thought was an intruder after entering an apartment she thought was her own. After deliberation, the mock jury found Hahn guilty of all charges. Parents, students, friends and other building staff filled the courtroom. 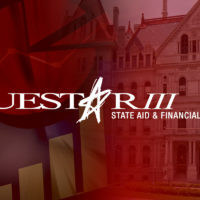 The mock trial was recorded and live streamed as well on Questar III social media platforms. Hahn reflected on the day’s events. 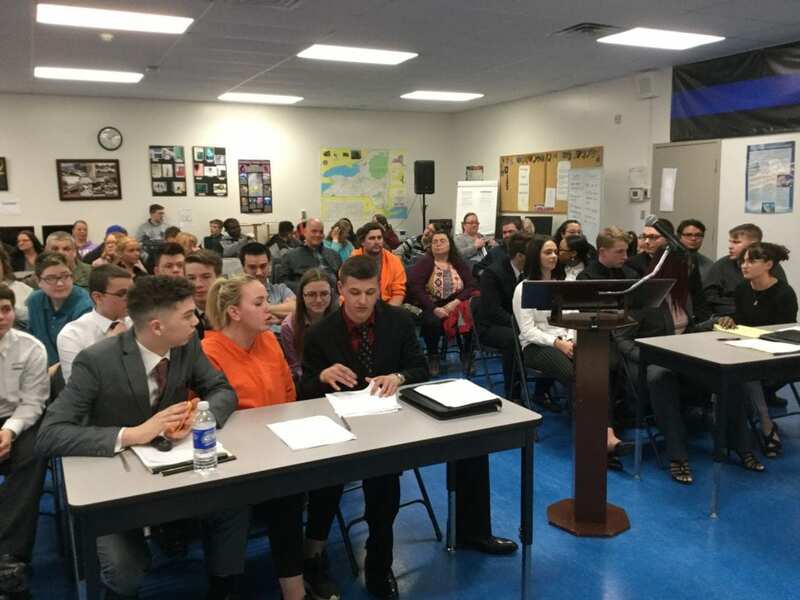 A packed crowd fills the “courtroom” at the Rensselaer Educational Center 2019 Mock Trial.